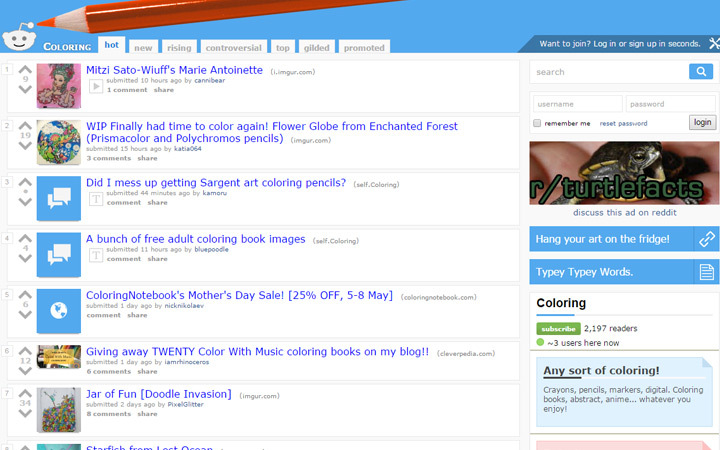 Reddit is the fastest growing online community site in the world with sub-communities on every subject you could imagine. This includes plenty of art subs for illustrators, painters, and digital artists. Some of these communities are made for beginners just learning to draw or paint. Others are for more experienced artists that want to share their work for critique. And of course there’s plenty of fun artistic stuff mixed in so there’s something in this list for everyone! 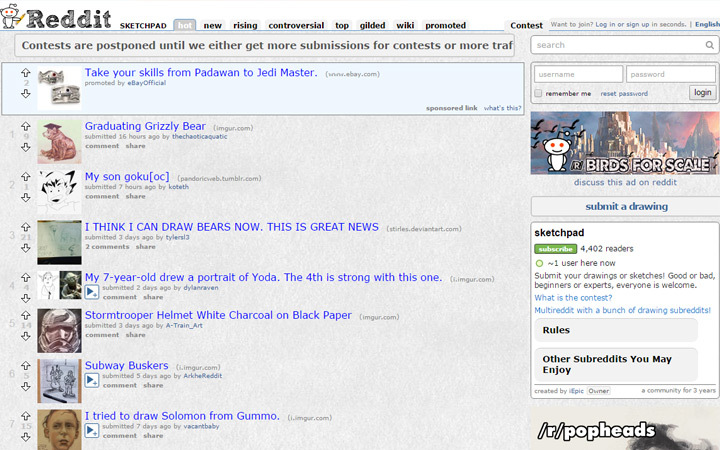 The daily sketch community spills into /r/sketchdaily with a new topic every day. There’s also a popular Twitter account @Sketch_Dailies with different topics, but a similar goal: one topic every day and a community of artists who draw that topic. 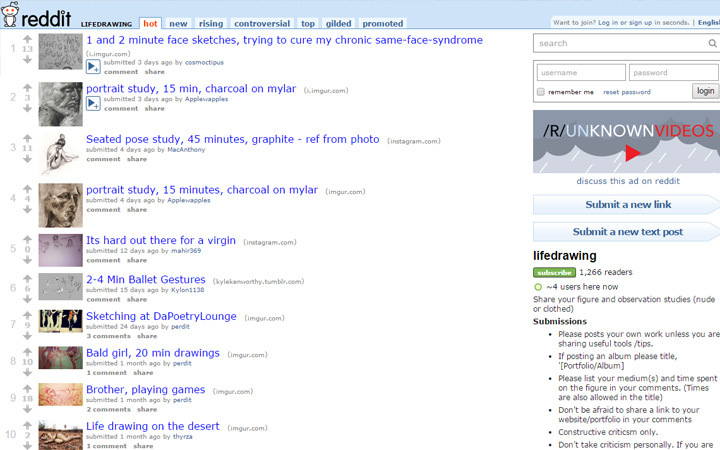 The Sketch Daily subreddit is more about actual sketching. Topics tend to be objects and animals with an emphasis on realism. Artists who need a way to practice more will jump onto this idea and love every minute of it. So if you’re trying to get into a habit of drawing every day consider this sub. You’ll be told what to draw so you don’t have to think about it, and you may even get some handy critiques along the way. Artists are always learning more about the craft because there’s always room to improve. But new artists can wind up frustrated, confused, or lost along their journey with no prior art experience. The /r/learnart community is a beautiful place to get feedback and to ask questions without fear of derision. Newbie questions are posted every single day and the answers are always fantastic. But you can also ask more detailed questions, or ask for specific critiques, since highly skilled artists also browse the sub to offer advice. This digital age has artists moving away from traditional materials and jumping into drawing tablets. These are great for many types of art, but the techniques are vastly different than graphite pencils or oil paints. 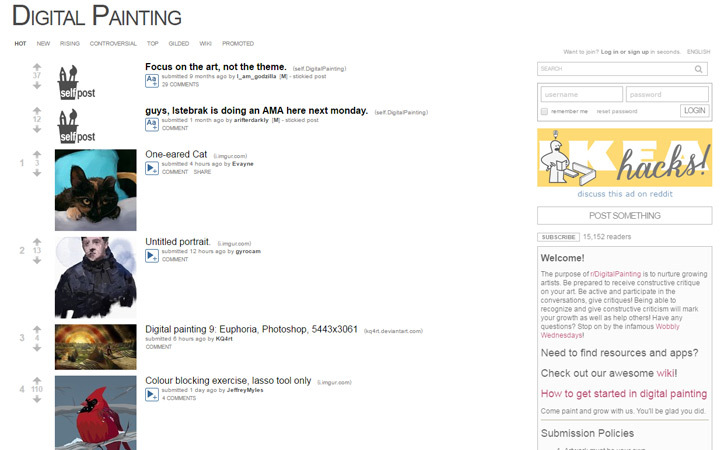 Check out /r/digitalpainting to see what others are painting and to gather critiques for your own work. Be aware this sub is specifically dedicated to artists looking to improve. It’s not a place to pat yourself on the back, but rather an online community that will truly help you get better at painting digitally. The creator of /r/ArtFundamentals studied at Concept Design Academy in Pasadena, CA. 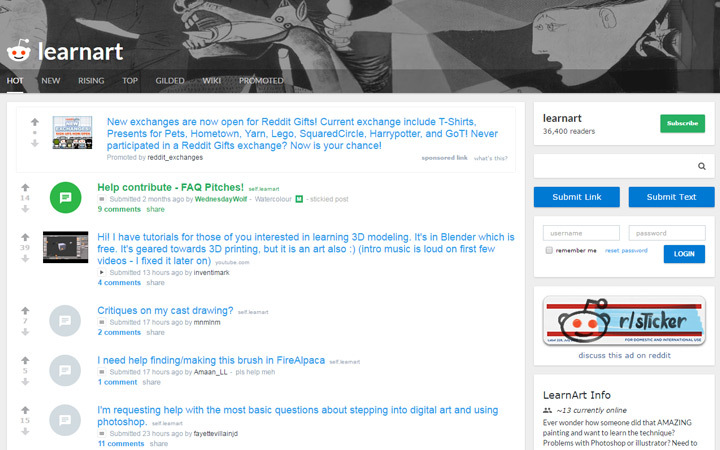 The sub is full of related art lessons created by one person and managed through the subreddit. All the individual lessons have been greatly improved upon with specific pages on the Draw A Box website. New artists are often concerned about how to practice and don’t know where to start. I’d say Draw A Box is a great starting point, and if you practice these lessons every day you will get better. Each week new critique threads are made on the subreddit so you can post your homework exercises. The creator then evaluates everyone’s work and offers advice on how to improve. Have you been practicing constantly and seen crazy improvements? Want to share those improvements on Reddit? Then /r/ArtProgressPics is the place for you. It’s a fairly small sub with only a few posts added each week. But it can be invigorating to see how much progress others have made in their artistic pursuits. And if you’ve made any strides you could be a big inspiration to others as well. Illustrators vary in so many ways from realism to cartoons and caricatures. 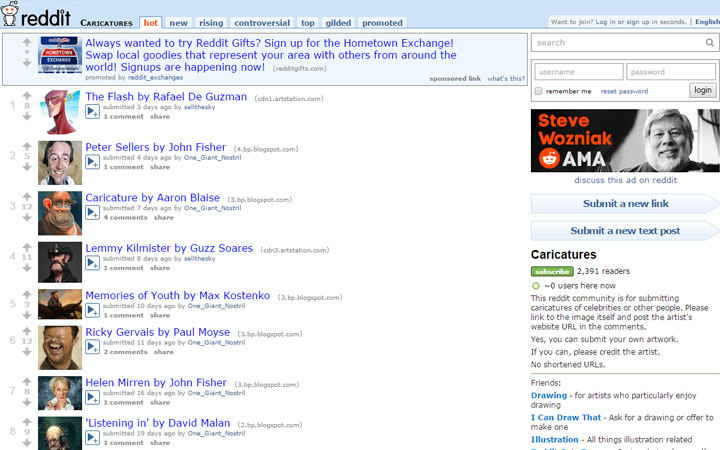 /r/illustration is the community for all these different illustrators to come together and share their work. Some posts are fairly generic while other posts have a focus on published work. 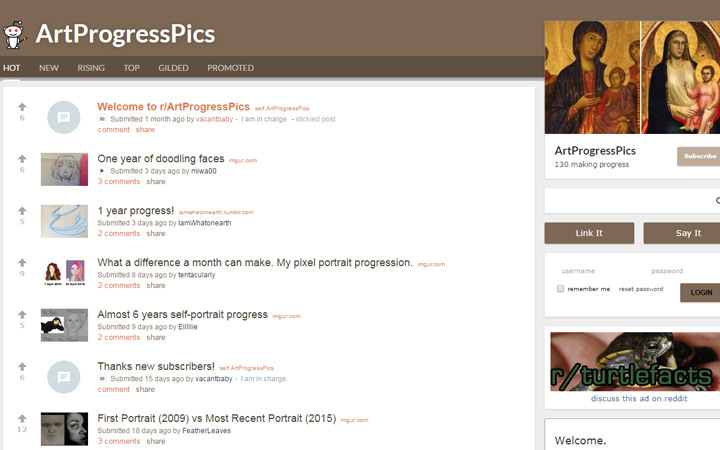 Like all art communities on Reddit, this can also be a great place to garner feedback. Professional concept artists put in the hours to achieve their dreams. Concept art is a mix of realism and imagination to create beautiful works of art for video games and movies. 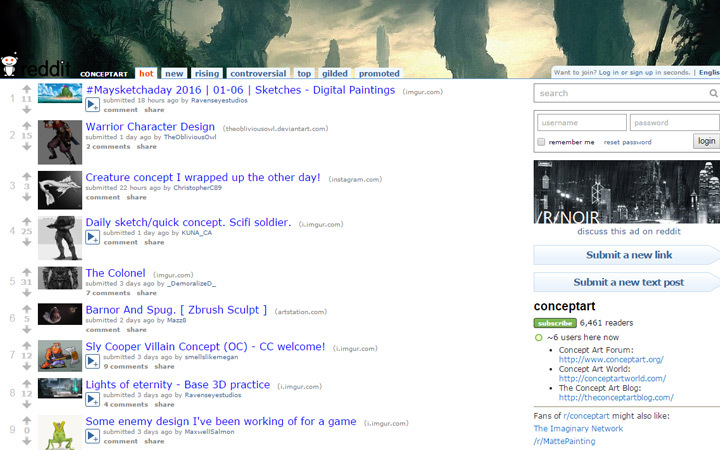 Reddit’s /r/conceptart community is the place to go for concept art news, tips, tricks, videos, and critiques. 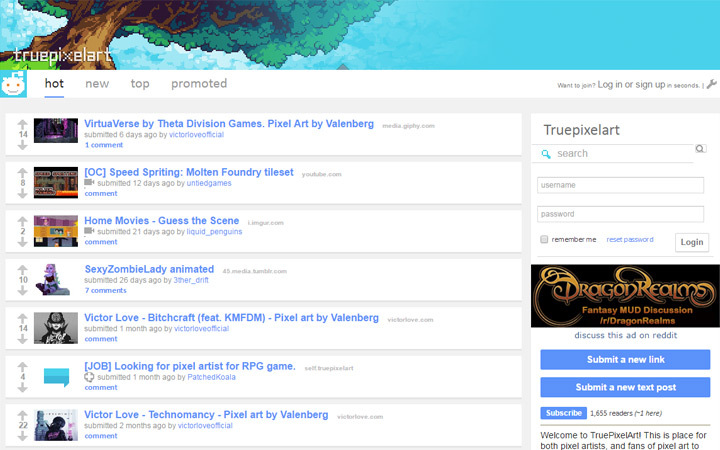 New posts are added daily and the community just keeps growing larger as the concept art industry itself continues to expand. Special concept art schools have even appeared in the past few years to train artists towards a career in concept art and entertainment art. This subreddit is the place to be for any questions you have about the industry. 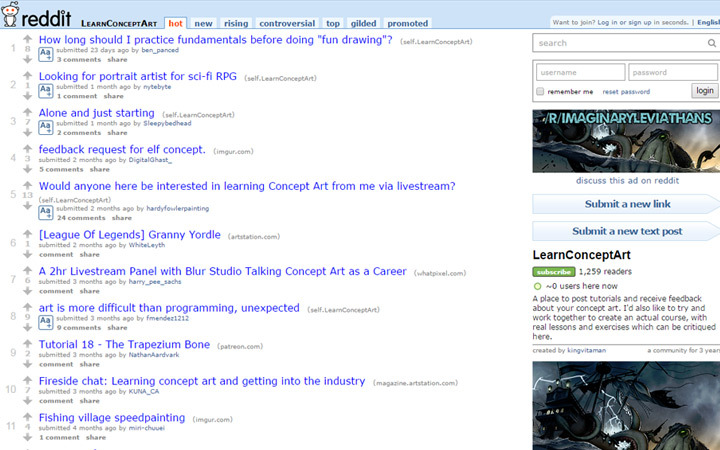 The sister sub to Concept Art is /r/learnconceptart, a place for self-posts specifically made by newbies who want to understand more about concept art from a pragmatic perspective. If you practice drawing and painting you will get better. However concept art requires a slightly different skillset, because a concept artist designs their ideas and then draws them to a full render. This can be intimidating to think about. But with time, practice, and the helpful folks at /r/learnconceptart, you can achieve anything. Here’s a somewhat silly yet also fun sub to browse in your spare time. /r/IDAP stands for I Drew A Picture and it curates submissions from all skill levels. Some pictures are kinda goofy, others show a real level of skill from the artist. Dozens of posts are added every single day so it’s a great way to find sketches and artwork to compare to your own. And if you’re feeling froggy you can even dump your own art into the sub. 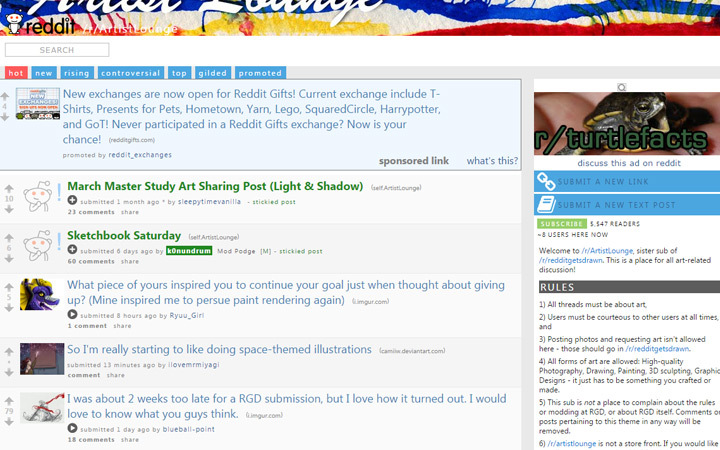 The premise of /r/redditgetsdrawn is pretty simple: a community of Redditors who want to see themselves(or their friends/family) be drawn by other Redditors who have the skills to do so. 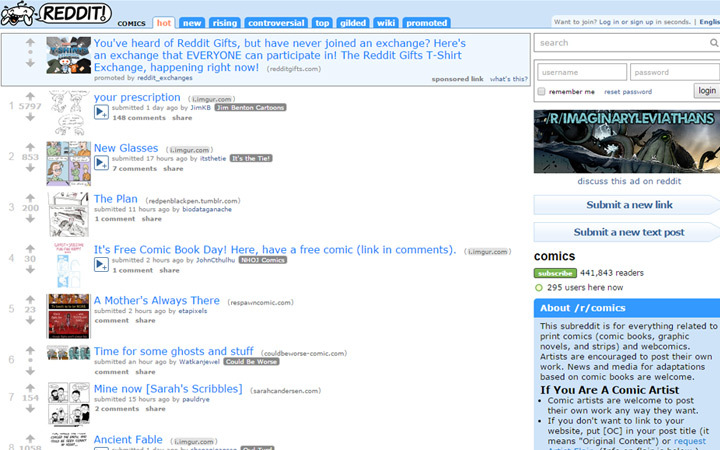 Currently the subreddit has just shy of 100k subscribers and it gets dozens of new posts every single day. It’s one of the best places to find random acts of kindness made by skilled artists all over the world. It’s also a fun way to practice your own drawing if you’re serious about improving. 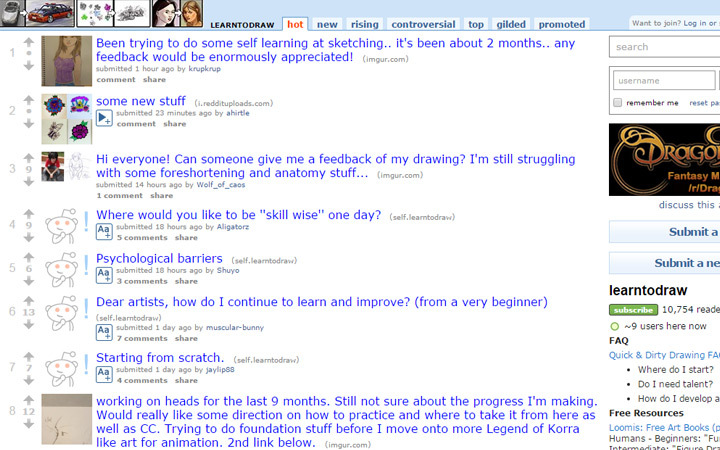 If the sketches daily feels too regimented then Reddit Gets Drawn is another cool alternative. 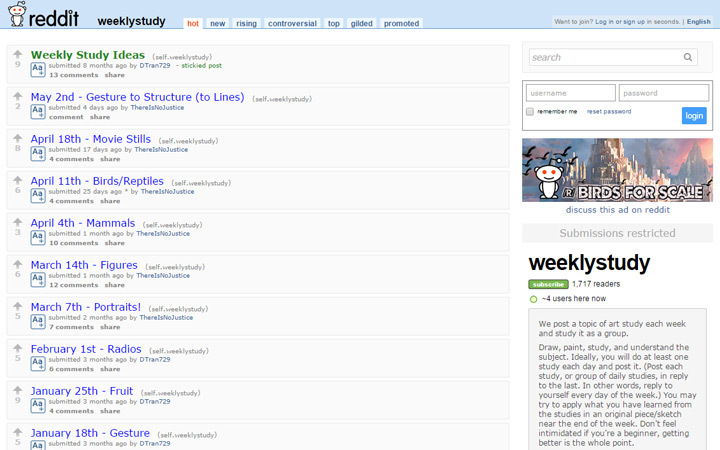 Another way to practice is with the /r/WeeklyStudy subreddit. This allows artists to focus one whole week on a particular study to improve their skills. The sub is very small with only ~2,000 subscribers. Because of this it may be tough to get immediate critiques for all your work. But it may be worth visiting if you’re in need of some cool ideas to practice. 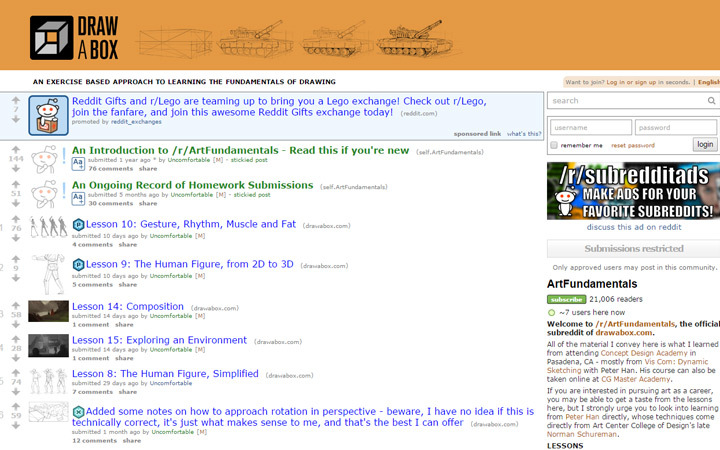 Much like the LearnArt subreddit there’s a smaller community at /r/learntodraw. As the name suggests, all posts focus primarily on drawing capabilities helping people get much better with a pencil. You can ask any question related to drawing. Artists are also free to post their drawings for feedback from the community. Right now the sub has over 10k subscribers and links to a drawing FAQ for getting started. Critiques are a very natural part of the growth process. You need genuine critiques to understand what you’re doing wrong and how to fix your mistakes. /r/ArtCrit is the place to get this type of feedback. Raw, honest, and always helpful, Art Crit is full of talented(and inexperienced) artists with one unified goal: to get better at art. It’s a surprisingly active place with multiple posts every day and an active community of commenters. For a more relaxed vibe check out /r/ArtistLounge. Rules are more laid back and threads can be about anything art related. This includes any form of art from 2D, 3D, and even graphic design. However even with the relaxed rules I notice the sub’s content does skew towards traditional artwork like drawing and painting. Still a great place to chat with other artists and ask questions you may not feel comfortable asking elsewhere. 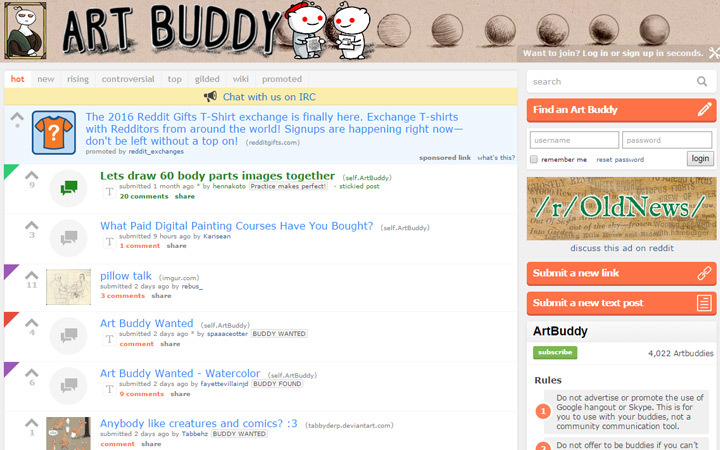 The /r/Artbuddy sub is a place for artists to find other artists to pair up and motivate each other. This concept of an “art buddy” is not new, but it is somewhat new in the digital world. Now with faster Internet speeds, chat applications, and community hubs like Reddit, getting an art buddy is as easy as posting and asking. Doodling is still a form of art, although much less constructed and more freeform/fluid. The /r/doodles sub is dedicated to people who love doodling on stuff: notebooks, receipts, serious IRS documents, whatever. If you doodle something cool you can share it with the community and gather thoughts from other artists(plus some sweet account karma). Every artist will agree that drawing from life is the best way to improve. 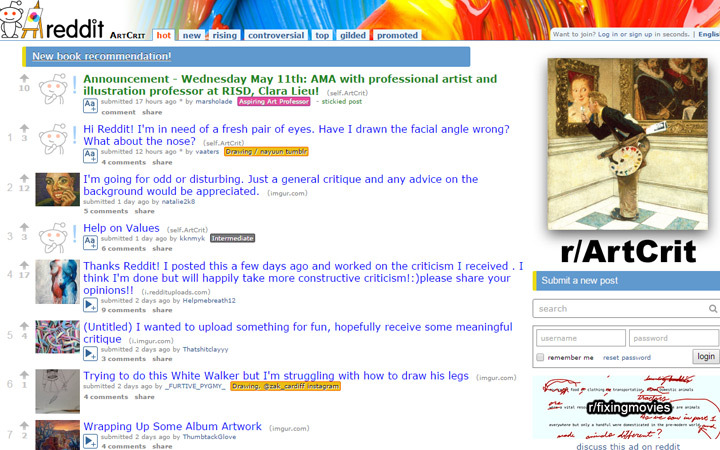 Reddit’s /r/lifedrawing sub is all about life drawing. You’ll learn how to start, tips to improve, and you can get critiques on any work you share. Plus it’s a fun place to study the work of others and see what they’re doing. 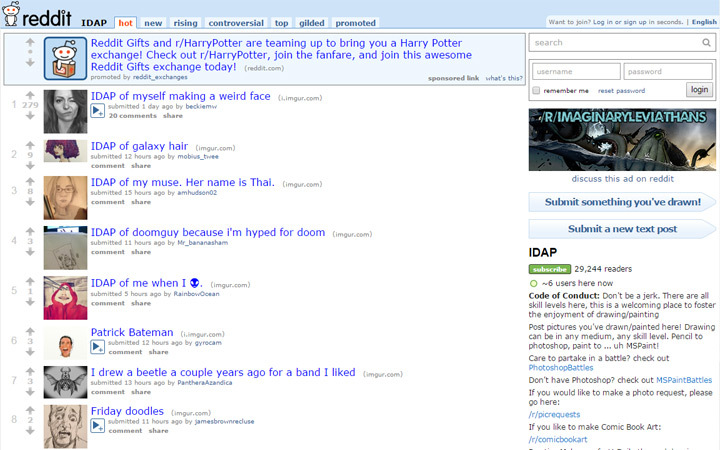 It’s a very small community with just over 1,000 subscribers, but new posts are added daily and despite the size it’s still very active. 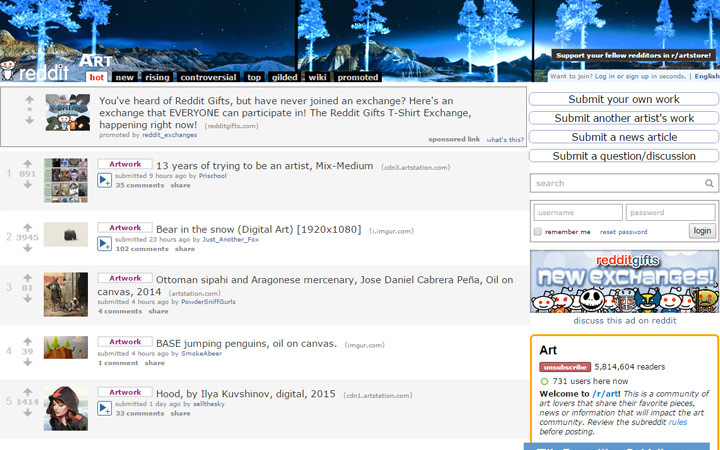 Reddit’s official artistic community is /r/Art. 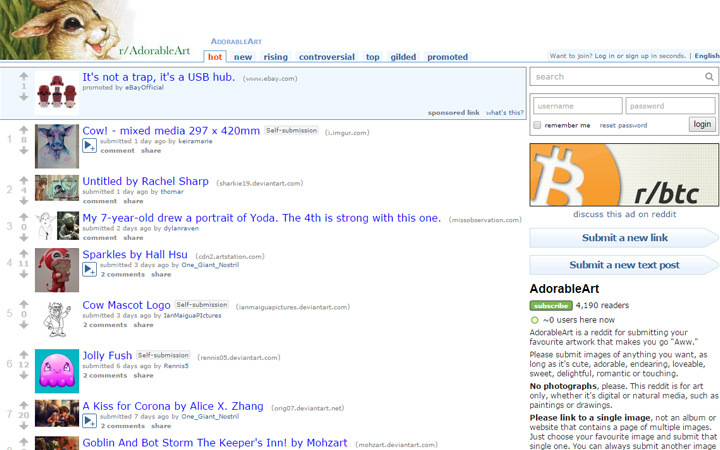 Boasting well over 5MM subscribers, it’s fair to say this is the most densely packed art subreddit on the entire website. Some artists may completely avoid the sub because there’s so much noise. With millions of people using the sub it’s tough to find gems or get attention to your own post. 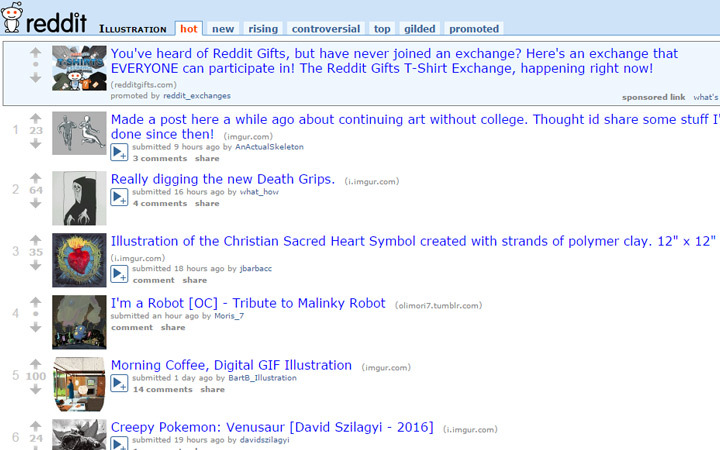 But it may be good place to browse if you’re looking for general art news or popular ideas in Reddit’s art community. Super cute art gives you that warm fuzzy feeling inside, and the readers of /r/AdorableArt chase that feeling like a drug addict. With about 4,000 subscribers there’s a lot to learn and a lot to see. Generally speaking there’s about one new post every 1-2 days. You never know what you’ll find and it can be a great sub for cute creative inspiration. When illustration gets as exaggerated as possible you end up with /r/Caricatures. This is the sub to curate all the best caricatures you’ve made, or others that you’ve found online. I have seen some incredible stuff on this sub and it’s one of my favorite places to find new artists. If you love crazy illustrative styles then be sure to subscribe. Hundreds of artists turn to web comics for creative expression. Some are well-known comics while others are still finding their audience. The best thing about /r/comics is that it levels the playing field. Anyone can submit their own work and if it’s good it’ll get attention. It’s a very creative sub with dozens of artists that regularly browse the site. If you’re thinking of making your own webcomic then this is a sub worth visiting. It won’t necessarily teach you how to make webcomics. But you’ll learn about comics by studying them, and you may have the chance to dialogue with comic creators. Don’t let the name fool you on this one. 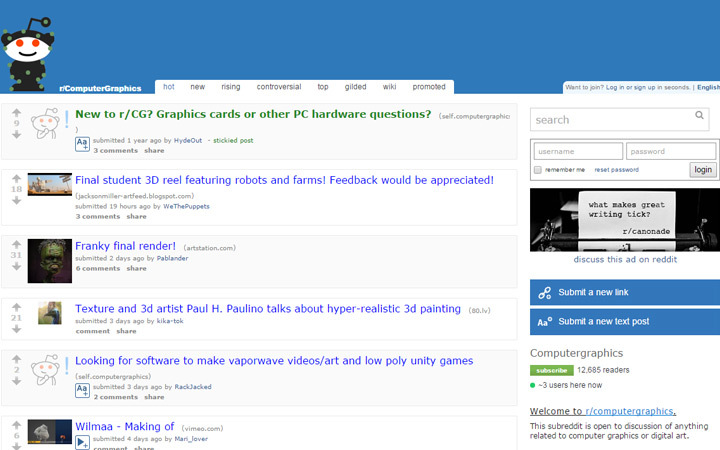 The folks at /r/computergraphics are super friendly to art-related posts, so long as they’re about digital artwork. This can include 3D modeling or 2D digital painting. Anything that can be created on a computer belongs in this subreddit. It has a large community of 12,000 readers with new posts added every day. 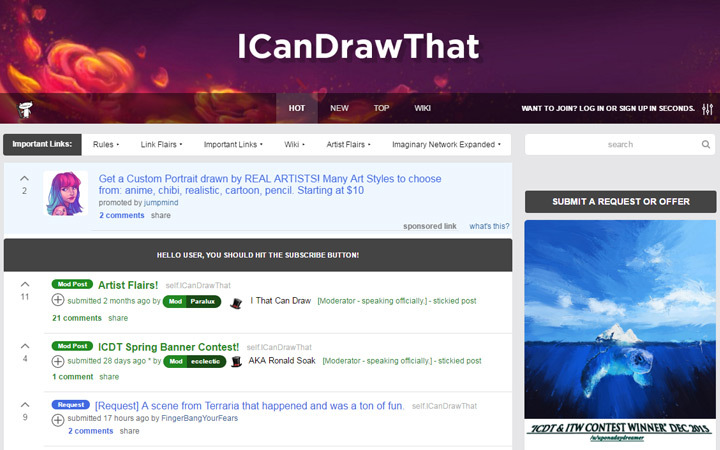 Reddit /r/ICanDrawThat is very similar to Reddit Gets Drawn. However people don’t need to post pictures of themselves, but rather anything they want to see drawn. It’s actually a much smaller community but still surprisingly active. 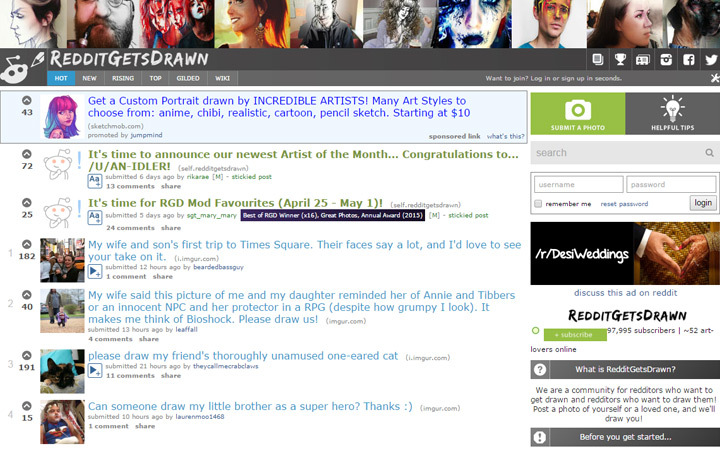 You can also filter the sub by drawing requests and offers to draw something for anyone. New posts are somewhat sporadic so you never know what to expect. 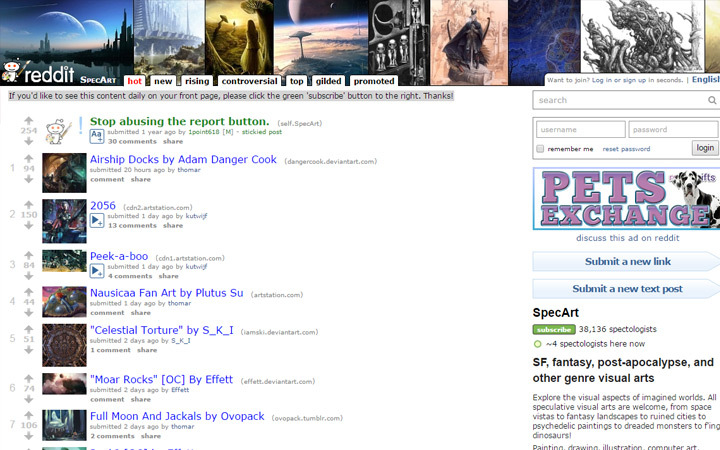 All visual genres are welcome in the /r/specart subreddit. You can post anything painted or designed on speculation, or even just for fun. Most content comes directly from DeviantArt or ArtStation with credit to the original artists. Some people use the sub to post their own work, ideally bringing exposure to their name. It’s a fun place to throw up your artwork if you have no place for it. 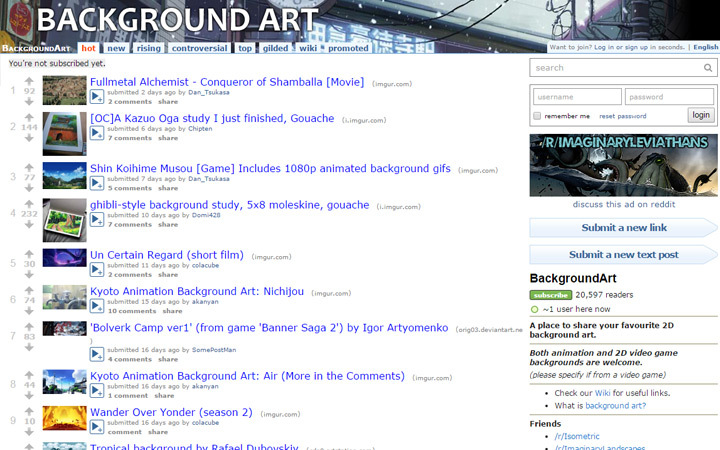 The /r/BackgroundArt subreddit is dedicated to curating the coolest background art from all over the web. This is mostly for official background art created for production, but it can also include case studies and personal work by artists outside the industry. This one’s simple and straightforward: if you love coloring your artwork, you’re gonna love /r/Coloring. It’s a very small yet diverse community of just over 2,000 subscribers. Coloring materials may include markers, colored pencils, watercolors, or anything else that involves traditional art. You sometimes see a few digital pieces but they’re less common. /r/sketchpad is yet another fun community where you can share rough work with strangers on the Internet. Every practicing artist should have a sketchbook, and once you’re comfortable with your sketches you may want to get some feedback. 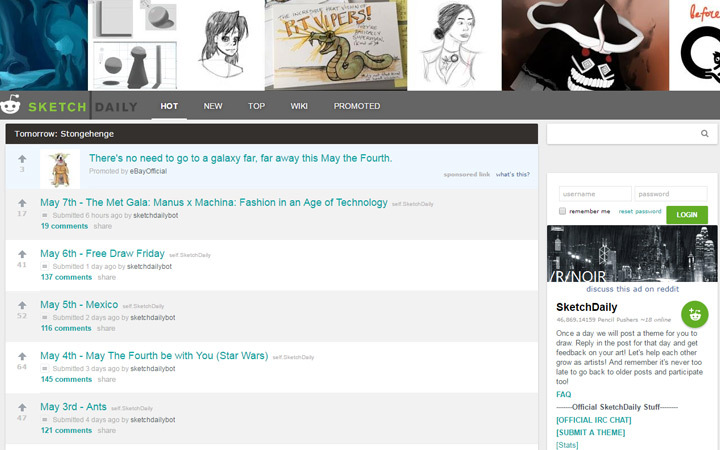 The Sketchpad community is very small and only averages 2-4 posts per week. But it’s a fun place to share your work and see what others are drawing in their sketchbooks. Digital artists rarely dive into the crazy world of pixel art because it’s so confusing and tedious. 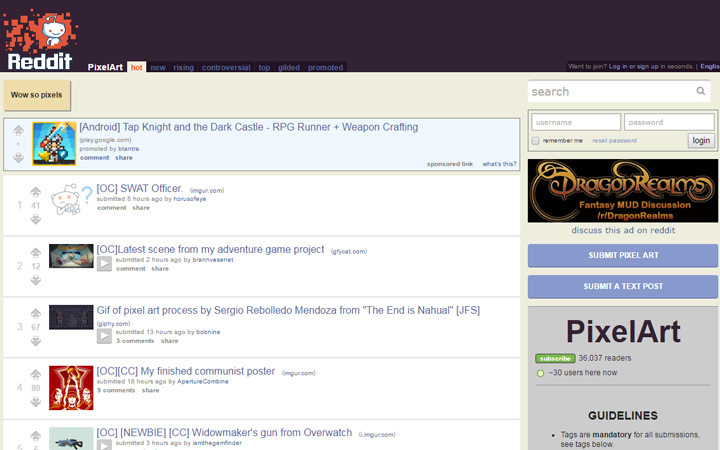 But the 36k subscribers at /r/pixelart love this craft and come together to discuss it daily. New posts are added on a regular basis, most of it being original work done by aspiring(or professional) pixel artists. If you’re curious to learn more about pixel art you can ask questions on /r/pixelart and expect very detailed answers. The community is very open to newbies and there’s a lot you can learn if you put in the effort. A smaller alternative to Reddit’s main pixel art sub is the spinoff /r/TruePixelArt. It follows the trend many of the other “true” subs for users to find a different moderation team with different rules for similar content. I’ll admit that True Pixel Art is very small. It gets maybe 2-5 posts every month and they’re mostly personal works. But if you’re looking to contribute to a different pixel art community this is a great place to start. If more passionate pixel people join and submit content it’ll be a much more active sub to visit. 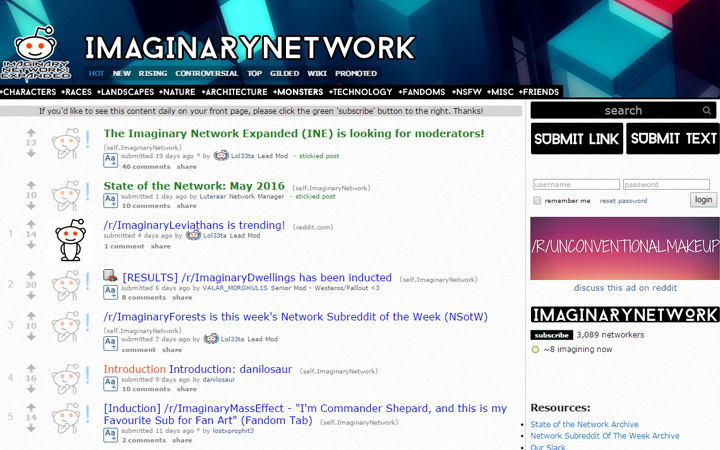 Lastly I want to wrap up with the voluminous /r/ImaginaryNetwork. This isn’t a single subreddit, but rather a network of subs featuring digital paintings of imaginary characters, landscapes, and crazy interiors. 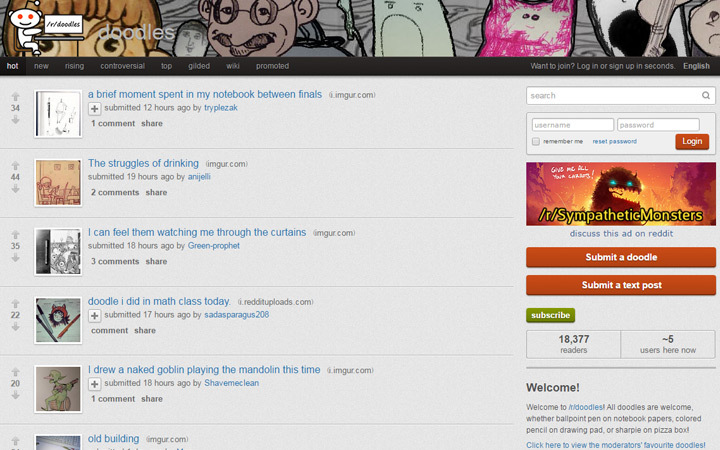 Take a look at the links on the homepage to see the available subs, or try searching Google for alternatives. You can do this by Googling “reddit imaginary keyword” and replace keyword with whatever you’re looking for(ie. castles, golems, pirates, etc). With all of these subs organized in one place I hope it’ll spur new users to sign up to Reddit and contribute. The online art community is already huge and it deserves even more talented people contributing their work, advice, and experience by helping others along their artistic paths.